" We use 20 trucks to carry logistic toward Lombok residents in the Jakarta Bersama Lombok program"
Around 212 tons of logistic are prepared for the earthquake victims in Lombok, East Nusa Tenggara (NTT) today. It is symbolically handed over by Jakarta Governor, Anies Baswedan at the Jakarta City Hall. "We use 20 trucks to carry logistic toward Lombok residents in the Jakarta Bersama Lombok program," he expressed, Sunday (8/19). On that occasion, the city government has done concrete actions through the Jakarta Bersama Lombok program by providing aid that was entrusted directly to the Aksi Cepat Tanggap (ACT) foundation. "We hope this aid can be used well. I invite the local government in Indonesia to jointly relieve the suffering of our brothers and sisters in Lombok," he explained. 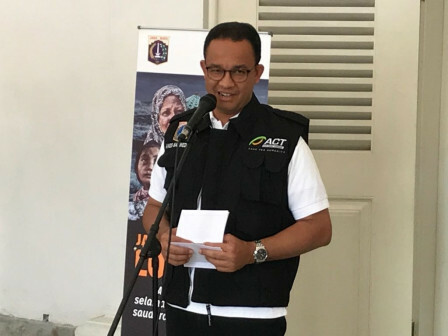 In the meantime, ACT President, Ahyudin delivered that those trucks are containing various basic needs that are needed by refugees, such as tents, blankets, water purifiers, food, milk, so forth. "InsyaAllah (God willing), our trucks will go to the location to the logistic post in Mataram City, Lombok. This post will supply logistics to a number of evacuation points," he stated.